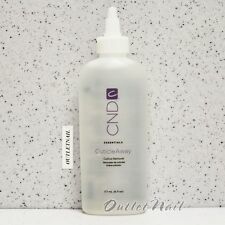 CND Cuticle Away - Cuticle Remover 177ml (6 fl oz). 1 - CND Cuticle Away 177 ml ( 6 fl oz). A professional-strength cuticle remover and callus softener. Dissolves dead skin (cuticle) for easy removal from the nail plate. CND CREATIVE NAIL DESIGN. CUTICLE AWAY – CUTICLE REMOVER. A liquid gel that quickly remove dead tissue from the cuticle area. We promise we will work with you directly to resolve any issue you may have. Superior mold ability in extensive color and coverage options. It provides long lasting toughness. Easy workability and gorgeous results. File Hot Shot CND a un pezzo -100/180 grana. MPN Hot Shot. 100/180 grit File. Shellac Gel Color Nail Palettes with chain & CND Shellac Label. The colors you see are for reference only. We promise we will work with you directly to resolve any issue you may have. Made in USA.